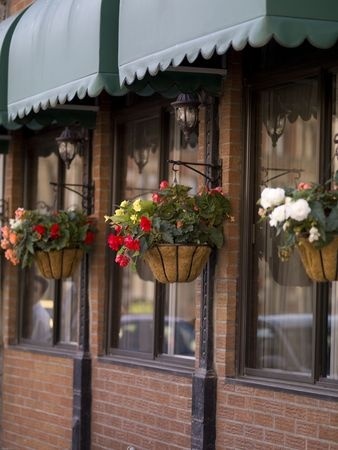 Awnings have been part of the business world for hundreds of years. Awnings can be great for the customers coming in and out of a business, because they are sheltered from the elements. These awnings have become such a standard part of life that they sometimes blend in with the surroundings. They should be advertising for your business and not just providing shelter from the passing storm. There are ways to make your awning stand out and do its job. Sometimes it doesn’t pay off to have the big flashy awning; it can be distracting from the business itself. Instead you may want to allow the awning to compliment the building and showcase what you have to offer underneath. Awnings should not be overloaded with information, either. If you have too much on the awning your customer may have a difficult narrowing in on what you want them to really see. What they should be seeing is your business, on the awning you may only want to include the name. Less is more and your eyes can only focus on one thing at a time. If the one thing someone sees is your business name then you are half way to a sale. If you are trying to decide what color or designs you should be using then you should make a compromise between what your business is and what the building looks like. If your business signature color or yellow and the building is purple, you may want to go with a striking black awning with white lettering. Stay away from busy patterns that may distract from the business name. Remember, this is all about bringing you more business, you don’t want to do anything to hurt your business. Make smart decisions and make your business look smart from the inside out.